Take a look at our venomous snake facts and learn some cool trivia related to the world’s most deadly snakes. Read about the cobra, rattlesnake, viper, black mamba, taipan, coral snake and more. Find out what makes these snakes both dangerous and unique! Venomous snakes have special glands and teeth designed to inject venom into their prey. There are around 700 different species of venomous snakes. Around 250 of these are capable of killing a human with one bite. As well as for attacking prey, snakes also use venom in self defence. The most common way to effectively treat venomous snake bites is with anti-venom. Snake venom can contain neurotoxins that attack the nervous system. Taipans are large Australian snakes that have high levels of venom. Australian brown snakes are highly dangerous and easily alarmed. Sea snakes are some of the most venomous in the world. Coral snakes are highly venomous but not usually aggressive, only biting as a last resort. Vipers have long, hollow fangs used to inject venom. When cobras are threatened they rear up and flatten their necks to appear larger. The King Cobra is the longest snake in the world with the ability to inject venom. They can grow up to 5.6 m (18.5 ft) in length. Rattlesnakes get their name from the rattle at the end of their tails. The snake shakes the rattle to warn or scare away predators. 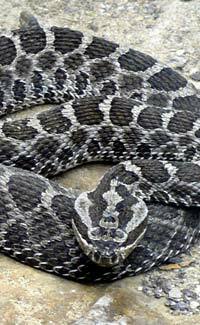 The most common snake bites in North America are from rattlesnakes. Black mambas get their name because of the black color inside their mouth. Black mambas are the fastest snake in the world.